Today this site becomes a group blog after more than three years as a solo effort. 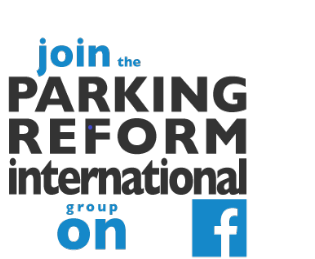 I hope we can make Reinventing Parking even more useful to you and become a key international forum for high quality insight on parking reform. First, a word of thanks to Seth Goodman of Graphing Parking (and one of our new authors) for his hard work to deliver this sleek new design. What do you think? Let me introduce the initial team below. But before I do that, I should point out that, even though I will mention some affiliations below, we are all blogging here in an individual capacity, not on behalf of employers or organizations. Stuart Donovan is based in Auckland, New Zealand. He is a contributor to Auckland's Transportblog and had a guest post here in 2012. He is a transport engineer and economist and has parking consulting experience across Australasia. Shreya Gadepalli leads ITDP in India from her base in Chennai. She tells me she 'loves talking about parking reform', which is fortunate, because she has to do so more and more. She is one of a team of three from ITDP in India who plan to contribute here. Seth Goodman is a designer and architect in Austin, Texas. He made a splash in the parking policy world in 2013 with the data-rich infographics at his Graphing Parking blog and will now continue those efforts at Reinventing Parking. He has also lived and worked in Bogotá, Colombia. Zhan Guo in New York City is an Associate Professor of Urban Planning and Transportation Policy at NYU Wagner. His published work on parking has looked at connections between street design regulations and parking, revealed fascinating insights into London's shift from minimums to maximums, and delved into the mysteries of residential parking in New York City, among other issues. He intends to be an occasional contributor. Gabrielle Hermann lives near Frankfurt-am-Main in Germany. She was co-author of ITDP's report, "European Parking U-Turn: From Accommodation to Regulation". Her recent academic work has moved on from parking but she hopes to be an occasional contributor offering insights into parking in Germany especially. Advait Jani lives in Chennai, India where he is ITDP program coordinator. He and ITDP colleagues, Shreya and Chris, plan to contribute as a team on India parking issues. Rutul Joshi is a columnist, blogger and Assistant Professor in Planning at CEPT University in Ahmedabad, India. He advocates safer streets and better walking-cycling facilities in Indian cities. He provided invaluable help to my 'Parking Policy in Asian Cities' study for ADB. Christopher Kost is based in Ahmedabad, India and a technical director with ITDP India, where he has worked since 2008. He completes the team of authors from ITDP India. Chris also helped the 'Parking Policy in Asian Cities' study in numerous ways. Andrés Sañudo in Mexico City is Parking Policy Coordinator with ITDP Mexico and has been deeply involved with recent and ongoing parking reforms and research there. Just yesterday, he posted at the Transeunte blog (in Spanish) on a current parking meter controversy in Mexico City. And of course I will still be here. If you are a regular reader you already know me, Paul Barter. I am an Australian who has lived in Southeast Asia since 1996 (Singapore since the end of 2000). For more information see the author profiles page (currently a work in progress).